MONSTER! #8 is crammed to the gills with 70+ pages of reviews, articles, and artwork featuring 2014 interviews with directors Roger Corman on his classic 1957 SF/Horror film NOT OF THIS EARTH and Lowell Dean of WOLFCOP, the ferocious wolfman films of Paul Naschy, Indian monster movie SHAITANI ILAAKA (that furry fiend featured on the cover! 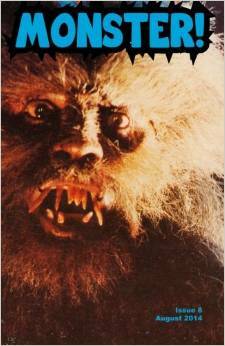 ), Steve Bissette covers monstrous fungus flicks, reviews and more! Monsters galore, nary a slasher in sight!